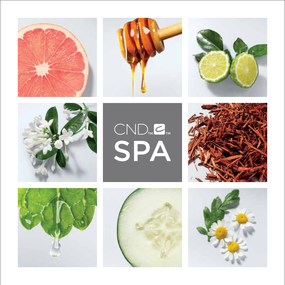 CND Spa…Escape on a journey of relaxation. Our botanical spa collection delivers a new level of treatment benefits for beautiful results. Spa treatments hydrate and soften skin with a botanical blend of soothing chamomile and purifying sandalwood. Spa treatments restore radiance with a brightening botanical blend of hydrating honey and purifying kaffir lime. A sole-ful journey of soothing hydration. The perfect finish to a pampering spa pedicure.